The Reds travel to Busch Stadium to visit with the St. Louis Cardinals to kick off the week. In past years, this has been a moment when I am filled with anticipation and some degree of dread. But you know what? One of the side effects of being in the midst of a fire sale is that losing just isn't that big of a deal anymore. It's ok. It's time to just enjoy baseball. I'll be rooting for the Reds to stick it to the Cardinals, of course, but it's with the knowledge that the Reds are going up against a superior team. 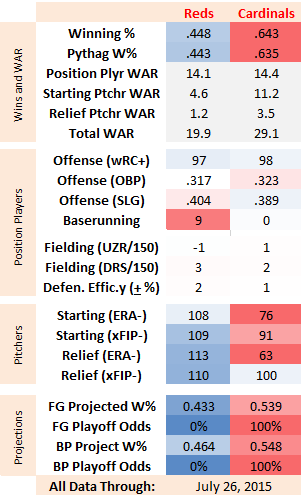 The difference, at least this year, however, is entirely wrapped up in their pitching staff. 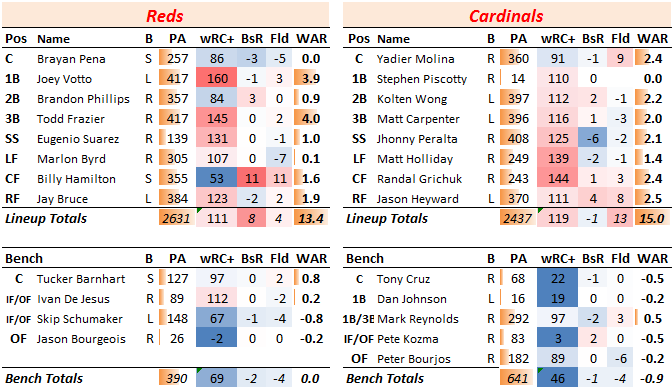 The Reds have had almost equivalent offensive production to the Cardinals, albeit in different ways: the Cardinals have gotten on base more often, while the Reds have had more power (and Billy Hamilton). The two teams have both been about league-average defensively. But the Cardinals have gotten superb starting pitching, which has been all the more impressive given that they lose Adam Wainwright in April in a freak pitcher-as-hitter accident. Their bullpen has been lockdown-worthy as well, again despite encountering a heaping helping of injuries. This is a deep, deep team, and that depth has been tested this season--and that depth has delivered. FanGraphs has them with a 99.6% chance of making the playoffs, the highest such percentage in baseball. 90% of that is through a division title. This is what we're used to seeing from the Cardinals: Strong offense from top to bottom, though without a lot of star power. 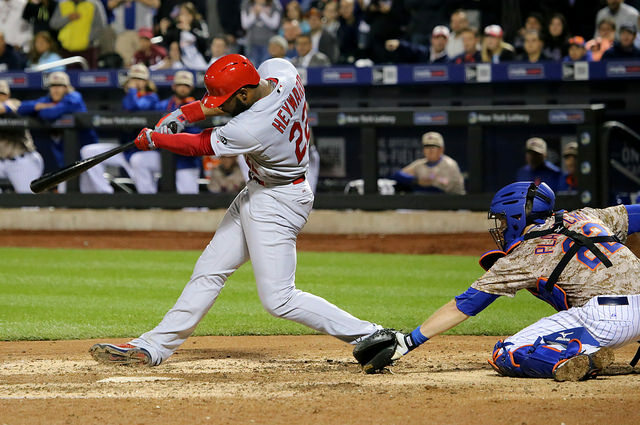 The new name is Stephen Piscotty, their 2012 #1 draft selection, and the latest part of the Cardinals machine. Entering this year, Piscotty was an extreme contact hitter with a decent eye and modest power for a corner outfielder. In his offseason review of Cardinals prospects, Kiley McDaniel wrote that the Cardinals "would like to see him trade some strikeouts for home runs so he can more traditionally profile in right field." This year, he seems to have done just that, showing jump in his strikeouts (which were a still very-reasonably 16% in AAA), but also a big jump in his home run production (11 in a half-season after hitting 9 all of last year). With Matt Adams out with quad surgery, the Cardinals are trying Piscotty at first base. There are rumors that they might pursue another bat via a trade (e.g. Adam Lind), but they might just go with Piscotty and see what happens. Worst case, they still have a platoon of Dan Johnson and Mark Reynolds waiting in the wings. Things I'm surprised to see: Randal Grichuk with positive fielding numbers despite playing in center field for the injured Jon Jay. Peter Bourjos awful UZR fielding score. Jhonny Peralta's low baserunning score. General poor performance from what's left of the Cardinals bench. Things I'm not surprised to see: everyone hitting. Yadier Molina with amazing catching fielding stats. Jason Heyward leading the team in WAR despite a slow start. The Reds are outclassed by this rotation, though the difference isn't staggering. I think there are some interesting comparisons here. Mike Leake and Jaime Garcia are basically following the same approach: not many strikeouts, but lots of ground balls and few walks (Garcia will be coming back from time off due to injury, so we'll see how much rust he has). Anthony DeSclafani and John Lackey even more similar, except that Lackey avoids walks far better that DeSclafani. It's one avenue that we might hope Disco might take to become a better pitcher. This series will hopefully be a good opportunity for Reds pitchers to learn from a pitching staff that gets it done. Before you look at this bullpen, it's worth noting that they've already lost Jordan Walden and Matt Belisle to injury. Nevertheless, they've gotten at least solid performance from the first to the last man. Rosenthal, Siegrist, and Maness have been effective in shutting down the later innings, and their mid-inning guys have generally done well. They've also been recently bolstered by Steve Cishek, who hasn't been great this year but was very recently a closer for the Marlins. With the Reds, however, while there are Chapman and Hoover, there are also catastrophes. And some of those catastrophic performances have gotten quite a few innings. Building a bullpen is hard, I guess. Reds: JJ Hoover and Jumbo Diaz are an interesting pair. The defensive-independent stats say completely the opposite as the more traditional record-keeping in terms of who has thrown well. I'm glad to see JJ Hoover having a nice season results-wise, but I do hope he can get his strikeout rate up over the rest of the season to prolong that success. Jumbo Diaz had another rough outing Saturday, but any time a guy pumps high 90's heat with control and with the expected strikeouts, I gotta ride that train. He might be a good case where control (avoiding walks) is clearly different from command (putting the ball right where you want it).